The Pentax 560mm f5.6 HD DA ED AW Lens is a super-telephoto lens specially designed for use with the Pentax K-mount lenses and features a newly developed high-grade multi-layer lens coating to deliver clear, well-defined images of distant subjects. 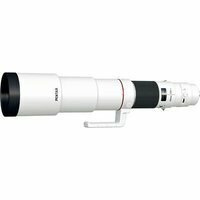 When mounted on a Pentax K-mount digital camera body, this super-telephoto lens offers an equivalent focal length of approximately 859mm in the 35mm format. The weather-resistant construction includes 29 special seals to effectively prevent the intrusion of dust and water into the lens interior.